Last Saturday, Rob and I attended the 26th Annual General Meeting of the Ontario Eastern Bluebird Society. This was only our second meeting and the first one since we starting running the groups Facebook page. It was an all day event, but when you're spending the day with like minded people and learning about things that interest you, the time goes very fast, too fast. The meeting starts with opening statements and members give nest box reports from last year. There is a guest speaker in the morning and another one in the afternoon. The always popular "Bucket Raffle" and lots of chatter and laughter, it's a grand time! I loved meeting people who follow the Facebook page. 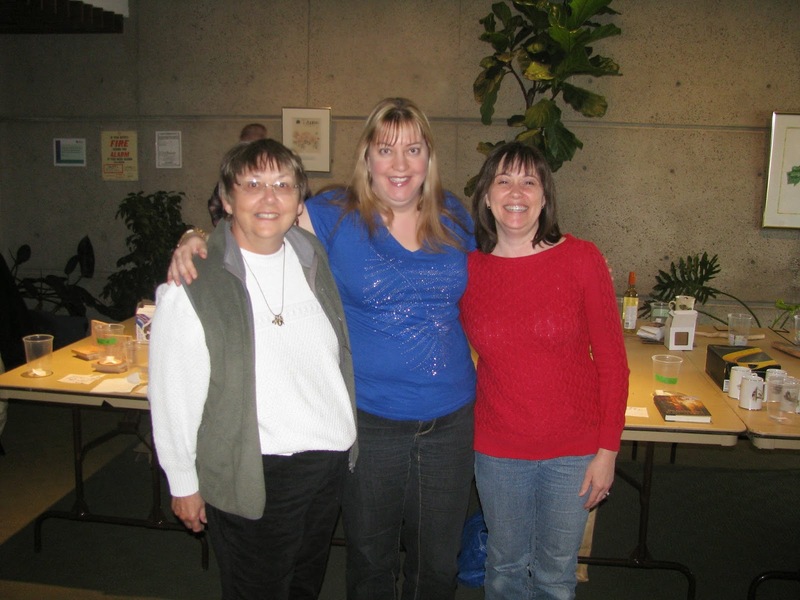 Me with Delores & Patty who both have nest box trails. 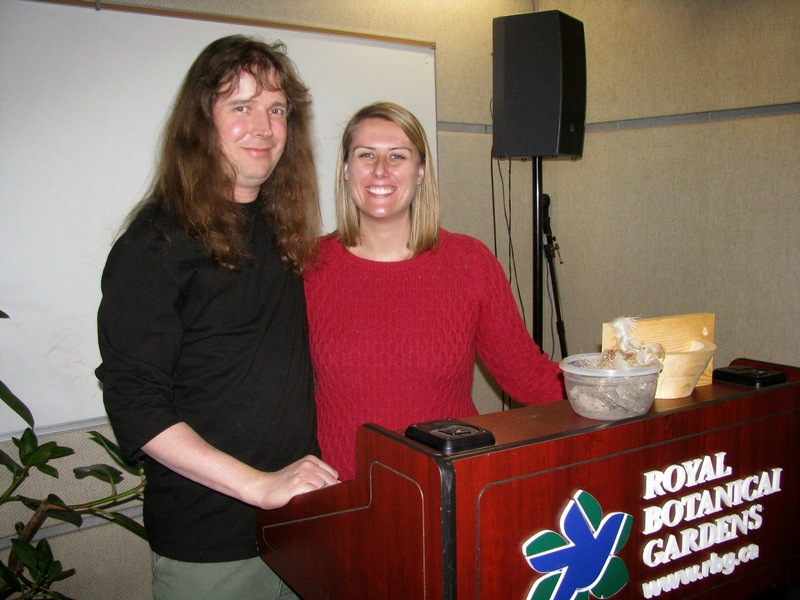 Rob with Kristyn from Bird Studies Canada. The morning guest speaker was Kristyn Richardson from Bird Studies Canada who gave a very informative talk on Barn Swallows. Barn Swallows are now on Canada's endangered species list. You can learn more about that and how to help by clicking here. In the afternoon Josh Sayers gave a talk on a species I'm not sure many people even knew live in Ontario, Badgers. Learn more about the Ontario's Badgers. Now that I know what to look for, I'm going to have my eyes peeled when we're in a habitat I know they would like. 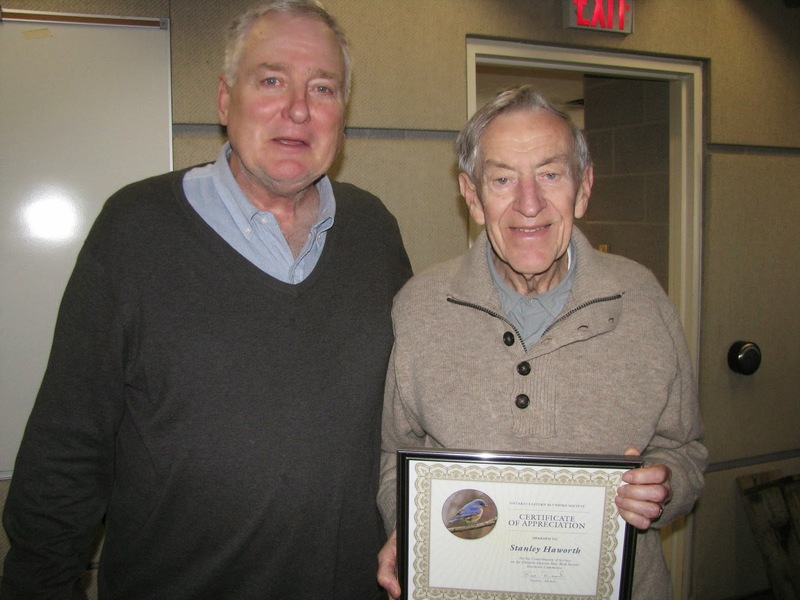 I have to share this picture of Bill Read, the Founder of the OEBS, and long time member Stanley Haworth. Bill presented Stanley with a certificate of appreciation for his long time service to the society. Stanley was instrumental in getting the society's charitable status and served on the executive committee for over 20 years. When Stanley gave his thank you speech he got a little emotional and teary eyed, which of course got me teary eyed. You could feel the love and respect he had for Bill and other long time members. 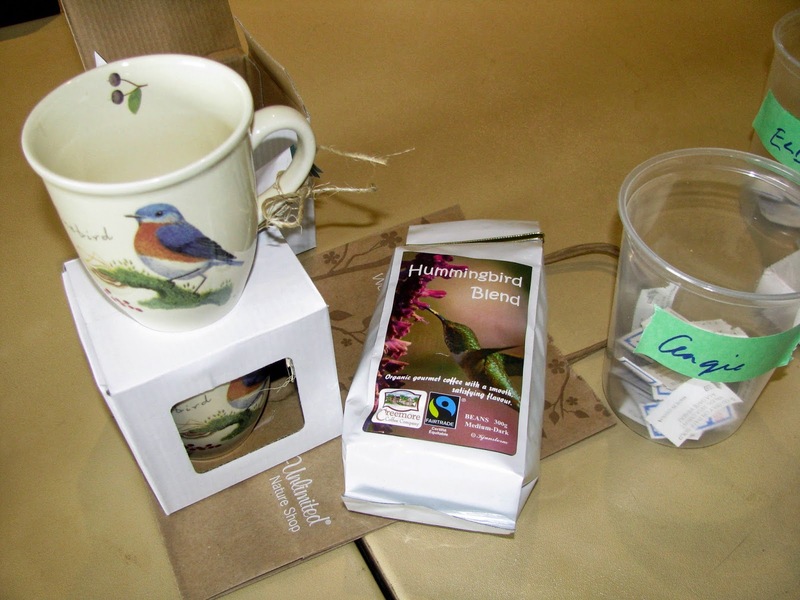 Our donation for the Bucket Raffle, 2 Eastern Bluebird coffee mugs and a bag of coffee. I love the Bucket Raffle and always buy lots of tickets. 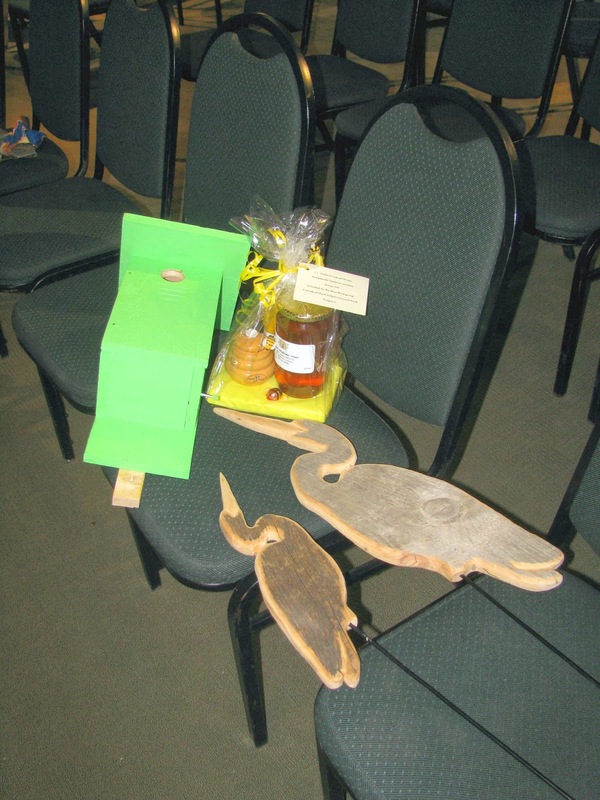 This year we won a couple handmade lawn ornaments, a homemade bird house and a honey gift basket! Our haul from the raffle. Eastern Bluebirds will be returning to Ontario soon to start nesting, keep your eyes open for them! 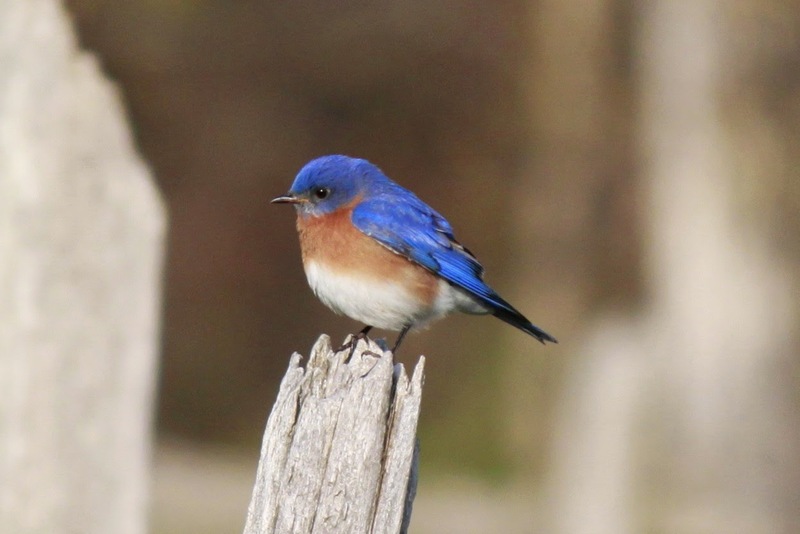 We're lucky down here in Windsor … Eastern Bluebirds can be spotted throughout the winter at Ojibway. I just love them! Migration is gaining momentum here and it's so EXCITING!!! I spotted my first E. Towhee yesterday and my first Brown Thrasher. Y.B. Sapsuckers are here as well. *birding* your hearts out. Sheesh.